The Base Hostels (sometimes named "X Base") are a chain of hostels in New Zealand (and Australia) that pride themselves on providing modern facilities, a long list of amenities that backpackers and budget travelers want, and a fun and lively atmosphere. They have locations in all of the main travel destinations around New Zealand, and sometimes it can be hard to avoid staying at one if you're on the backpacker trail. This is because they can sometimes dominate the competition by offering lower prices, providing better amenities in a newer building, have a better location in the town, and so forth. The Base Hostels cater to younger backpackers from around the world, and as such they tend to have a reputation as "party hostels". The management of most of the Base Hostels does not shy away from this reputation, so long as all of the guests are safe, happy, and having a good time. So, if you're looking for a quiet and relaxing hostel where you don't have to interact with other guests, this may not be the place for you. But if you're looking to stay up late, meet other guest, and go out to bars and clubs, then the Base Hostels are definitely for you (at least the ones in the major cities). 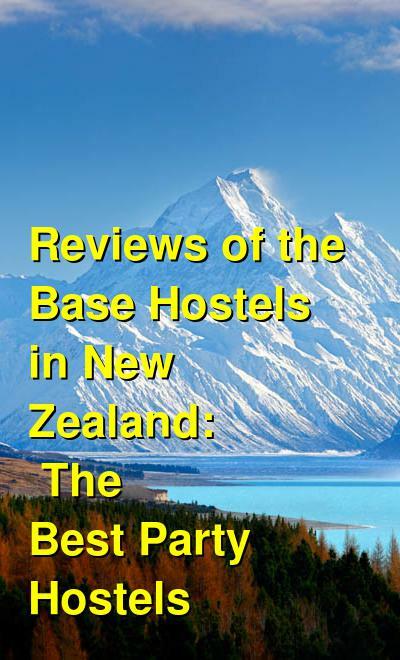 The Base Hostels in the smaller cities, while very social, might not always be "party hostels" due to the more touristic nature of the town (such as Wanaka or Taupo), but plenty of social activity still exists. Overall, the amenities are terrific. Most, if not all, of the Base Hostels offer modern bathroom facilities, comfortable dorms with sheets, private rooms (some with ensuite bathrooms), fully stocked kitchens, common rooms with pool tables, TVs with video games, outdoor balconies or patios, BBQs, hot tubs and spas, and more. The list of features and bonuses is long, and the prices are good. Combined with the social vibe, these great amenities keep guests happy and coming back for more. Reviews from previous guests tend to center around a few key problems. First, the overall size of the hostels (they tend to be quite large in some places) means that the bathrooms and other facilities are not often kept clean. While management has made statements that the staff works tirelessly to keep everything as clean as possible, sometimes it seems that they are just a bit overwhelmed. After all, if you're sharing a bathroom with other guests, you can't realistically expect a cleaning crew to tidy up between each person's shower. Second, many guests complain about the noise factor of other guests staying up late. In the larger hostels, this can sometimes be a problem. It may depend on the particular layout of each hostel as well, as some dorm rooms house more beds, and some dorm rooms are closer to the common areas. If you're looking for a good night's sleep, be particular about where you stay, or even which room you stay in. Again, if partying isn't your thing, then some of the Base Hostels might not be for you. With a perfect location and plenty of common areas and bars for the massive number of guests, the Base in Auckland is more like a mothership for backpackers. They offer so much for budget travelers such as a job finding service, modern facilities, games and TV rooms, dorms and private rooms, Wi-Fi, and more. Free breakfast, an onsite bar, a great staff, and terrific common rooms top the list of amenities at this vibrant and social hostel in Queenstown. It's active year-round, so check it out. Check out the photos! This hostel looks like a modernist hotel, and the outdoor courtyard area lets guests relax in the sun. A bar is next door, and the central area of town is only a 10-minute walk away. Free Wi-Fi, spacious common areas, and multiple room types. Right in the middle of all of the action in Wellington, this hostel offers more than just a party vibe. The facilities are modern and clean, the kitchen is great, the common rooms have games and TVs, and more. The party goes late at the onsite bar with DJs at the Base Taupo. This hostel has clean and modern facilities, and is walking distance to everything in town. 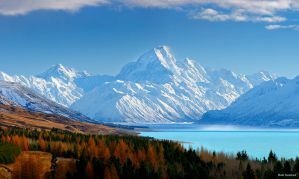 They can also set you up for your treks and other activities in Tongariro and the surrounding region. Located in central Wanaka, this hostel is within walking distance to everything in town. While the list of amenities is long, and the facilities are modern, they receive mixed reviews for cleanliness and noise.